The cool of Fall is here and we enjoy seeing all of the new ads at MilitaryAvenue! There are so many new ones and their great Military Rewards make choosing the best one a very tough job! As most of the country starts cooling off, indoor activities and entertainment can be a top search/choice for military members in a new community! Do you know a theatre that gives a military discount? Tell them about MilitaryAvenue! 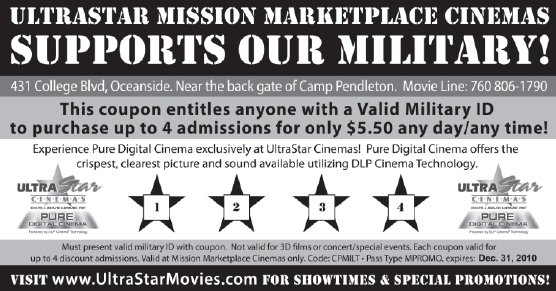 Click here to view coupon featured at Camp Pendleton. A special thank you to UltraStar Cinemas Mission MarketPlace 13 and all of our MAPP partners for supporting your military community with your Rewards. On the first of every month MilitaryAvenue Alerts is published to thousands of members of the military community around the country. Do you keep your MilitaryAvenue ad up to date? We want to keep our military families interested in receiving Alerts and do not want to be 'grabbing their attention' with out of date ads. Therefore, the most up to date ads are listed first in the Alerts email that is sent out each month. A great action-item to add to your electronic-calendar is a monthly-reoccurrence: "Update my ad on MilitaryAvenue". Update it the week prior to the first of the month and know that your ad will be seen first, above the 'less-then-up-to-date ads'. We want to help you reach the military-community! Be sure to put your best foot forward for them. 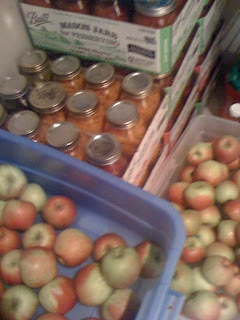 The first of the month will be here before you know it. Military families ... They deal with frequest moves, and in turn getting to know new communities. They also can deal with deployments or days away on missions that they (as family members) can't know details about. It isn't easy for a military family. Not only are they missing their solder, airman, marine, coastie or sailor, but they are also worried about them. Military Family Support. It is a necessity. There are many ways the military families can find the support they need. They search for outreach programs, ways to connect. They need them. They can find it on base at their local Family Support Center or through their Youth Center. They can also find it off-base or -post. They can find the support they need through a local church, through their children's school, or at a local YMCA. We, at MilitaryAvenue, created a category for children's support. Cub Scouts, Boy Scouts, Girl Scouts, Church Youth Groups, YMCA programs... you get the picture. All ways that children from preschool age to college can find the outreach they need as they struggle with the worries, missing mom or dad for a year at a time, or getting to know new friends in a new world for them. Like our category Worship Services, a Military Discount is NOT required to create a free-ad. If you are the representative of a Youth Program and want to spread the word to the military-community simply explain how your organization is going to support the military-family. This will fulfill the requirements for the Military Discount field. We can't wait to see your ad on MilitaryAvenue. Thank you! from thousands of US Military Families for supporting us all. - Leanne from MilitaryAvenue.com, a proud Army-wife who has benefited from organizations like yours! PS Thank you to Girl Scouts of Western Washington for being our first "Youth Activities" Partner. Become a MilitaryAvenue Partner TODAY! Occasionally I revert back to my military experiences when planning events for the family. I receive some friendly harassment from family members who are used to it and also those still adapting to the "colonel" in their lives. But my planning is part of the strategy of getting the most of life; following my principles and God; and taking time to care for those who I protect and love. So my strategy sets the tone for my planning. What is strategy? To better help me explain why a business should offer a military discount as part of their marketing plan I did some research. Strategy is from a Greek word and basically outlines the policies of the organization to meet goals! Goals like how much in sales, revenue and profit do we need to keep our doors open? That is what I am talking about! So after establishing some policies we then need to plan to fulfill our strategy and meet our goals! Why should I market to the military? A marketing plan to reach the military community with your products or services means you are aiming at a young demographic of 18-34 year olds (most with families)! They are frequently deployed to many locations around the world in defense of your freedom! That would almost seem like its enough but that is a patriotic emotional appeal and does not fully explain why a discount should be part of your plan! They have significant choices of product/services to choose from and why would you not want them to help you grow? Will a discount increase my sales? Will the increased sales meet my goals? How much of a discount can I afford? One time? Special events? Continous? Does my competition offer a military discount? Where is the nearest installation? Do you know how many customers are military? Do you want to increase military sales? Expanded market with larger military presence! Being seen as a military friendly business is often a draw for newcomers. Civilian population appreciates your support to the military community too! Increased market reach through branding of your product/services with military personnel spreading the word for you! The idea of developing a strategy and planning for your sales to a larger military audience can be exciting! Have you thought it through? Ready to design it? Talk to us and we can help you reach out to the military community today! List with us for free with a discount or upgrade to reach a wider audience! We use multiple social media to spread the word about your ads! Facebook, Links from Government websites, Twitter and more! We want to help the military community connect with reliable, ethical and intelligent businesses who care about their country and want to profit while supporting the deserving men and women of our armed forces and their families! 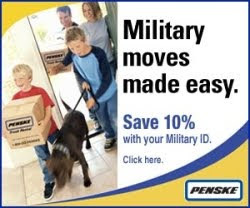 PS: Thank you Penske for the great support to the military community with your services and military discount! Military Support Organizations - get your name out there! USOs, VFWs, American Legions, Fisher Houses & other military support organizations... Make your presence known to the military community on MilitaryAvenue! Did you know that you too can be listed on MilitaryAvenue? Be sure to get the word out about the support you give to the military community around you. Create an ad, where you will be listed not only in the "Rewards" section around that Military Base but also in the category "Military Support" at that base. Not only will you be listed on MilitaryAvenue ... but you will also be included in our monthly Alerts, sent directly to our military-subscribers email boxes. What else can you do on MilitaryAvenue? List events on MilitaryAvenue around your installation. Having a special event for the military-community then let us know! We can't wait to post it for our families to get a feel for their new community. September is here and the kids are back in school, many military folks are settling into new locations and finding new restaurants to eat at and enjoy new surroundings! Near Jacksonville Naval Air Station and Mayport Naval Station in Jacksonville the sailors and other military personnel can find a restaurant with a great Military Reward discount! The Ortega Hurricane Grill and Wings at 5907 Roosevelt Boulevard! Ortega Location Only!!! 20% off entire check with Military or GS ID. 99 cent Hurricane Lager. Gameroom, Sporting events (college and pro package). We cater. Click here to view coupon featured at Jacksonville NAS. A great big shout out to the Ortega Hurricane Grill and Wings and all of our MAPP Partners for supporting your Military Community with your Rewards!